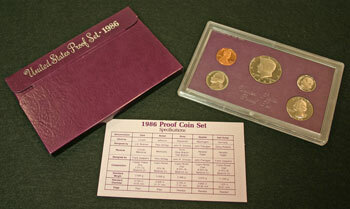 The US Mint continued the purple package for the 1986 proof set and added a card showing the coin specifications. 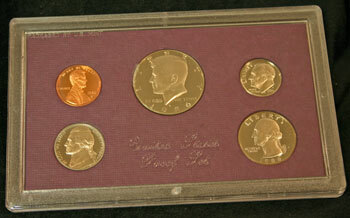 The proof set contained five coins of $0.91 in face value and was sold by the US Mint initially for $11.00. 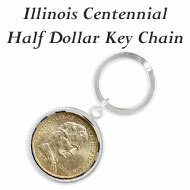 The five coins in the 1986 proof are the Lincoln cent, Jefferson nickel, Roosevelt dime, Washington quarter and Kennedy half dollar. 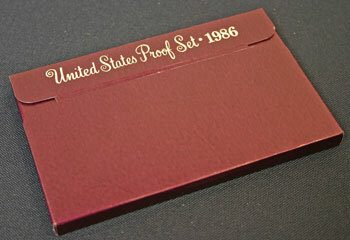 The 1986 proof set box is made of a purple card stock with a textured surface. Though, the purple color is somewhere between purple and burgundy. 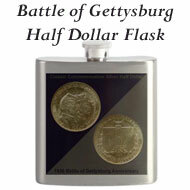 On the top flap, the silver script states "United States Proof Set • 1986" in contrast to the purple color. The box dimensions are roughly 3.5 inches by 5.5 inches by 3/8 inch. 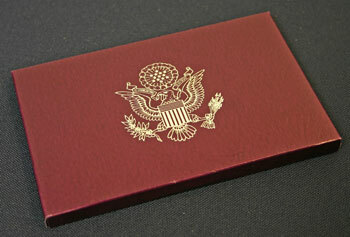 The opposite side of the proof set holds a silver heraldic eagle centered on the box. 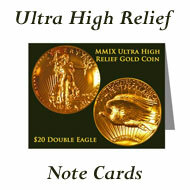 The proud eagle holds an olive branch in his right talons and arrows in his left talons. 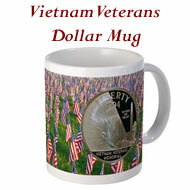 His beak holds a banner showing "E PLURIBUS UNUM." As did the previous year's proof set box, the 1986 box opens at the top. 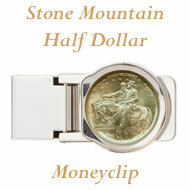 The lettered flap slides open in order to remove the proof coins in their protective lens from the top of the boxl. 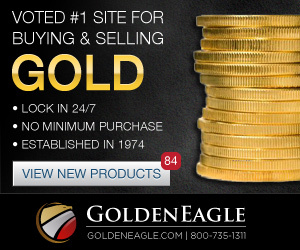 The 1986 proof set includes the five coins in their protective lens, and for the first time, the annual sets included a card which listed the 1986 Proof Set Coin Specifications. 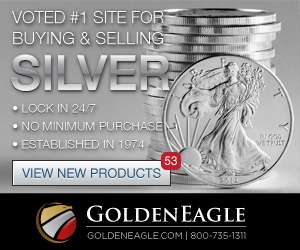 The US Mint's procedures were consistent in 1986 and did not introduce any known varieties in the proof sets for that year. Of interest, though, the proof set population in 1986 was almost one million less than the previous year's sales. 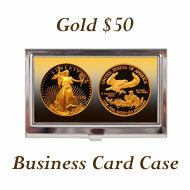 After missing a year, the US Mint returned to the Prestige Proof Set program in 1986. 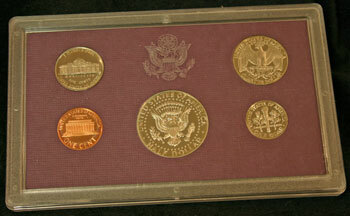 The 1986 Prestige Proof Set contained the five proof coins of the regular proof set along with a silver dollar and a cupro-nickel clad half dollar, both commemorating the Statue of Liberty. 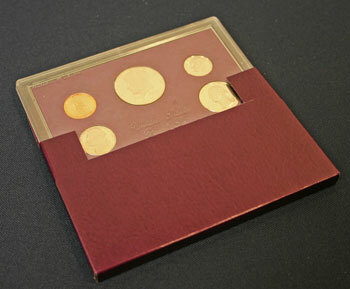 In the regular proof set, the five proof coins are uniformly spaced in their individual circles in the purple card board insert and held between two clear pieces of plastic. 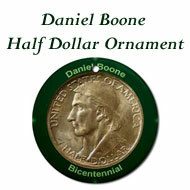 "United States Proof Set" is centered beneath the Kennedy half dollar in a clear, raised script. In the upper left corner, clear block letters state "PACKAGED BY U.S. MINT." Flipping the set over to view the reverse, the heraldic eagle (same design as on the proof set box) is centered above the Kennedy half dollar reverse and between the nickel and quarter. 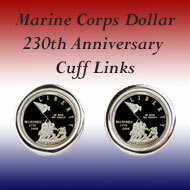 Click on the 1986 Proof Set Coin Specifications to view the details about the individual coins in the annual proof set. The world population in 1986 was 4,942,034,793. This represents 72.1% of the world's population in 2010. 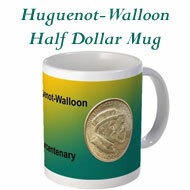 $100 in 1986 equals $198.96 in 2010 dollars using the Bureau of Labor Statistics' Inflation Calculator. 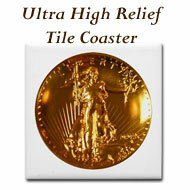 New houses in 1986 cost an average of $111,900 which would be $222,636 in 2010 dollars. 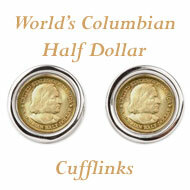 The average income was $17,322 per year which equals $34,463 in 2010 dollars. Gas was $0.857 per gallon which would be $1.705 in 2010 money. The average new car was $12,652 equivalent to $25,172 in 2010.